The spill stretched for about a mile between Park and Brighton avenues. 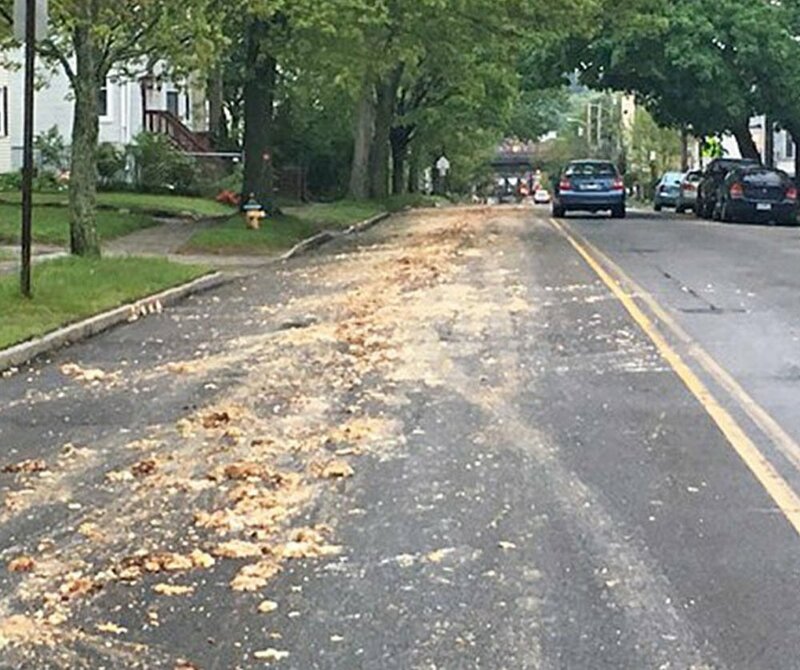 An unknown number of gallons of chicken parts spilled over a mile of St. John Street in Portland early Tuesday morning. Residents woke up to the messy – and pungent – spill in the Libbytown neighborhood. The chicken parts, which police say were not hazardous, spilled when the tailgate of a truck operated by Agri-Cycle Energy, a Maine-based food waste collection company, malfunctioned, allowing waste to fall out, according to city officials. The truck was hauling the food waste to ecomaine for processing. Portland police Lt. Robert Martin said the truck malfunctioned around 5 a.m. and the company that owns the truck cleaned up most of the mess. One lane of St. John Street between Park and Brighton avenues was strewn with chicken parts until around 7 a.m., WCSH-TV reported. The TV station said cars were driving through the parts at 6 a.m. before police and cleanup crews arrived to take care of the mess. Dan Bell, general manager of Agri-Cycle, said this is the first time one of the company’s collection trucks has spilled food waste. When the driver realized the waste, including other food, had spilled, he immediately stopped the truck. The company called police for help, then brought in a second truck and five more employees to help shovel the waste off the street. Bell said he doesn’t know exactly how much spilled, but the spill stretched for about a mile down St. John Street. “Based on what I saw, it wasn’t a tremendous amount,” he said. Agri-Cycle operates a fleet of trucks that collect food waste from restaurants, supermarkets and other businesses and bring it to companies that convert the waste into electricity, fuel and fertilizer. According to federal motor carrier records, Agri-Cycle operates about a dozen trucks, and has passed seven of the last 14 safety inspections in the previous two years. It had one reportable crash last August, but details of the incident are not public. The carrier has not been assessed any penalties by federal authorities in the last seven years, the amount of time for which records are publicly viewable. By 9:30 a.m., the piles of waste had been removed, and all that remained were faint stains and a lingering odor, and a city of Portland street sweeper made several passes through the area to help alleviate the stench. The Department of Public Works was called in to help clean up the smaller pieces after truck company employees used shovels to load the bulk of the waste back into the truck. City crews helped spread sand and sweep up the mess, then used a street sweeper and water truck to rinse the road. Bell said the company is still trying to determine why the truck gate malfunctioned and what needs to be done to make sure it doesn’t happen again. He also said the company will work with the city to make sure the cleanup was thorough. “We will continue to monitor this with public works to make sure if smells develop we address this immediately,” Bell said.